Call A to Z Entertainment, Inc. today for free information about how to hire or book Christian rock music singers, Thousand Foot Krutch. We are your best booking agent and top talent agency for hiring live Christian rock band and musicians, Thousand Foot Krutch! We book or help you hire any live professional entertainment you want, to include – Christian musicians and Christian rock singers and live bands. We also help you plan and produce your show, so call us today at 888-655-4575. A popular 1966 poem, “Please Hear What I’m Not Saying,” begs the reader, Don’t be fooled by the face I wear, for I wear a mask . . . I tell you everything that’s really nothing, and nothing of what’s everything, of what’s crying within me. Thousand Foot Krutch takes a hard-rock hammer to this universal matter of hidden emotions-confronting what lies beneath us and, in turn, burning off some major tension on its fifth Tooth & Nail album, Welcome to the Masquerade. Take off your masks, and let’s let it all out. Release what’s undercover ’til the truth comes out, spits front man Trevor McNevan on a title track that surges with action film adrenaline before cresting to a blunt spiritual admission: I’m not okay. “We all wear masks,” says McNevan, setting the stage for his band’s theatrical new work. “We hide what we don’t want people to know we’re thinking or feeling. And that’s easy to get away with when life is so busy. A lot of times, we have no idea what’s really going on in the life of the person right beside us.”In fact, Welcome to the Masquerade reveals what Thousand Foot Krutch continues to learn from its growing legion of fans. Since the Toronto act’s worldwide launch in 2003, otherwise introverted listeners have felt surprisingly comfortable pouring their hearts out to McNevan, drummer Steve Augustine, and bassist Joel Bruyere. Through these songs for the broken and brokenhearted, Thousand Foot Krutch provides that crucial outlet to a widespread audience. Welcome to the world of no one’s listening-I just want to break out and escape this prison, seethes McNevan on “Bring Me to Life,” where an icy piano part melts into the fiery assault of guitars. With as much aggression but a more thumping groove, “Scream” portrays someone whose turmoil is like a mask that I don’t want to wear anymore. But soon enough a flicker of promise emerges: I’d give everything I am just to feel something. With hope comes levity, and Welcome to the Masquerade will be heralded for its rave-ups just as much as its darker depths. 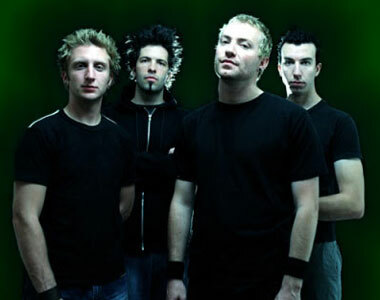 An early Thousand Foot Krutch hit (“Rawkfist”) earned airplay on ESPN’s SportsCenter and throughout the professional sports world, and in that vein, the new “Smackdown” pays perfect stomp-clap homage to Queen’s “We Will Rock You.” There’s also “Fire It Up,” an in-your-face anthem with an irresistibly simple hook. “We were trying to capture all of what we love best about rock music,” McNevan explains. “I enjoy the fusion of music with sports and movies-things TFK is blessed to have been a part of before. Now, sometimes I’ll go to a football game or catch a great action or superhero film just to get that rush of excitement.”Named after an old X-Men comic from the 1960s, “E for Extinction” showcases a pure hybrid of the band’s dynamic and maturing creative talents. Tapping back into the album’s theme of insecurities and the need for transformation, the track mixes a sweetly melodic, stripped-down verse with a ferocious chorus marked by lyrics about how we camouflage ourselves. Such sensitivity is further explored on Masquerade through a handful of tunes more aligned to pop radio, a direction TFK explored with great success on 2007’s The Flame in All of Us. “Watching Over Me” is musical poetry, a soul-searching ballad where McNevan sings, Take my broken glass, and help me make a window, so I can see your face. “Look Away” is equally powerful yet more ragged and rocking; a key song based on e-mails and letters McNevan has received from fans over the last few years with lyrics that plead, Take all these cuts, and make them shine, and all this pain I’ve held inside, so I can find my way home again. First single “Forward Motion” is a swirling and soaring call for the entire world to find its way home again-a timely plea given the state of many nations.”Between the economy and everything else, this is as good a time as has ever been to drop our stereotypes-all the stuff that separates us-and get down to the black and white of loving people as God intended it to be,” McNevan suggests. Welcome to the Masquerade was recorded in Seattle, Nashville, and Canada, produced by Aaron Sprinkle (Anberlin, The Almost) and Trevor McNevan with additional production by Thousand Foot Krutch, and mixed by Randy Staub (Nickelback, Metallica). Concerts promoting the album will be elaborately staged (the cover art provides a hint), but the music itself was purposefully arranged with raw public performance in mind.”We don’t like to record anything we can’t pull off live,” concludes McNevan. In a world of masqueraders, Thousand Foot Krutch welcomes you to the ball! We can help you book or hire any Christian musicians and any live Christian rock bands. We’re your best booking agency and agent for hiring Christian rock singers, Thousand Foot Krutch, so call 888-655-4575 today and we’ll be happy to help you. A to Z Entertainment, Inc. is not the exclusive booking agency for any live entertainers on this site.